We will be discussing two recent, relevant opinions in our weekly SoCal IP Institute meeting on Monday, May 23, 2011. The first deals with the sufficiency of a trademark applicant’s intent to use an applied-for mark. The second case involves a claim of reverse confusion. A brief synopsis of the cases is presented below. SmithKlein Beecham Corp. v. Omnisource DDS LLC, 97 U.S.P.Q.2d 1300 (T.T.A.B. December 10, 2010) (attached). SmithKlein opposed the registration of the AQUAJETT trademark by Omnisource on the basis that Omnisource lacked intent to use the mark on the goods when it filed the application. Omnisource was unable to produce evidence of intent to use other than the use of the word in patents directed to the goods and minutes from annual meetings with vague references to the development of products of the type identified. In view of the lack of evidence of intent to use, the TTAB found that Omnisource lacked the requisite intent. THOIP v. The Walt Disney Co., 08 Civ. 7823 (S.D.N.Y. May 10, 2011) (attached). THOIP, owners of several unregistered trademarks in the “Little Miss” line such as the “Little Miss Trouble” shirt shown below, sued Disney for trademark infringement based upon its “Little Miss Disney” and “Miss Disney” lines of clothing. 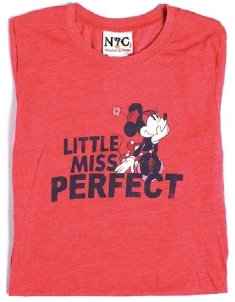 An example of Disney’s “Little Miss Perfect” t-shirt is shown below. Both parties moved for summary judgment on the issue of reverse confusion. Disney moved to exclude a rather complex THOIP survey that was proffered in an effort to demonstrate so-called “reverse confusion” between the junior user (Disney) and the senior user (THOIP). The district court agreed with Disney and excluded the survey as flawed. First, the survey failed to be based upon market conditions likely to be found in reality. There was almost no evidence that these shirts would ever be sold side-by-side, but they were presented that way for the survey. Second, the survey failed to have an adequate “control” group because the alleged “control” group shirts were more unlike than like the Disney shirts. Third, the survey conflated confusion between two sources with mere confusion as to the source. For example, if a respondent indicated that he or she believed that two shirts, one by Disney and another by THOIP, were “put out” by the “same company”, he counted that as confusion, even without a mention of Disney. Fourth, the survey opened with a display of five sets of products, only two of which were T-shirts, either Little Miss or Miss Disney. In this context, the two products were clearly open to comparison. The survey was ruled inadmissible. In response to the summary judgment motions, the court found that THOIP failed to show that its marks would be likely to become associated with those of Disney. Furthermore, THOIP failed to show actual confusion, after being invited by the court to do so, through the use of the flawed and excluded survey. In view of an earlier decision finding a close balance of the factors associated with the reverse confusion claim and the addition of two factors favoring Disney, the court concluded that reverse confusion could not be found and dismissed the case. All are invited to join us in our discussion of these cases during the SoCal IP Institute meeting on Monday, May 23, 2011 at Noon in our Westlake Village office. This activity is approved for 1 hour of MCLE credit. If you will be joining us, please RSVP to Amanda Jones by 9 am Monday morning. Why can’t the court allow Plaintiff to offer another survey? Why is the Plaintiff limited to one shot? It is my understanding that the case had already been postponed a bit to provide THOIP with the opportunity to generate the survey. Almost all issues on reverse confusion were determined in a prior decision. The survey took some time and expense to create and providing them the opportunity for a “redo” was perhaps to much to ask of the defendant. In our own internal discussions, we’ve come to the conclusion that surveys are simply very difficult to do correctly. Or, at least, they’re very easy to poke holes in after-the-fact.